Calories - Burger ~700kcal, Salad + Pie - Unknown. I'd first like to start with apologising for the delay of new reviews from my Middle East trip. The photos are being held hostage on my girlfriends camera, and since her friend is visiting Singapore from Korea, I keep forgetting to grab the photos before heading into the office. I didn't want anyone to think that I'd forget about them, so I'm posting this retro review from back in 2008. 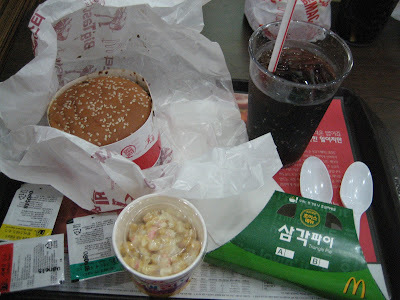 This was actually the first time I had McDonald's in Korea. I wasn't living there at the time, but it was when I visited Korea for the first time as a tourist. I had been there for a couple of days already before befriending a couple of businessmen working for Columbia (the sporting company). We spent the day hiking together, and they wanted McDonald's for dinner. This was long before the blog, and I wasn't actually that interested in having McDonald's, but this was the first time I had a meal on a company expense account, the poor student that I was at the time, I couldn't say no to a free meal. Whereas the guys I was with ordered 2-3 Big Macs each, I tried to keep it as local as possible by having my first Double Bulgogi Burger, substituting my fries for a Corn Salad, and adding on a Triangle Pie. No idea how much this cost, because it was so long ago, and that I didn't even pay for it, but it was before McD's in Korea hiked their prices in 2009-2010 so it was probably pretty cheap. When I wrote my full review for the Bulgogi Burger back this May, I stated that they removed the centre bun (Big Mac style) from the Double Bulgogi Burger. In 2008, the burger still had the bun, but unfortunately I don't have a photo of it unwrapped. I did have it a few months later when I returned to Seoul later that year. This was also back when most McDonald's in Korea still used plastic cup for their dine in customers. You can still find it in some branches, but since the repeal of the law that mandated all restaurants charge for paper cups, many have reverted back to the standard paper cup. My personal photo of the 3 bun, double Bulgogi Burger, and illegal paper cup! To be totally honest, I am not sure if the Triangle Pie was a promo item, or a standard menu item. I cant find any information on it in English, so if I can convince my girlfriend to dig up some info in Korea and we discover anything I'll post an update in the comments below. What I do remember about this pie was that it was filled with chocolate, and it had a flaky crust. I found a better photo of one on Flickr, though he doesn't not comment at all about it. I tried a similar flaky triangle pie a few years later in Korea, but that one was filled with Pumpkin. I ate the entire thing, but I wasn't overly impressed with it, it lacked enough filling, and the crust was dry. The corn salad a regular menu item substitute for fries. I guess since KFC does this in Korea (something I never had), I guess McDonald's wanted to follow suit. It was so long ago, that I don't remember the exact flavours, but I do remember that it was terrible and that I didn't finish it. More mayo than corn. If you've ever been to a Korean donkatsu restaurant, you'll know this as it is usually served on the side. Other Asian countries substitute a cup of plain sweet corn for the fries, but I guess Korea had to go and take something healthy and make it terrible for you. KFC in Hawaii has corn on the cob or loose corn. We also have rice as a side item.